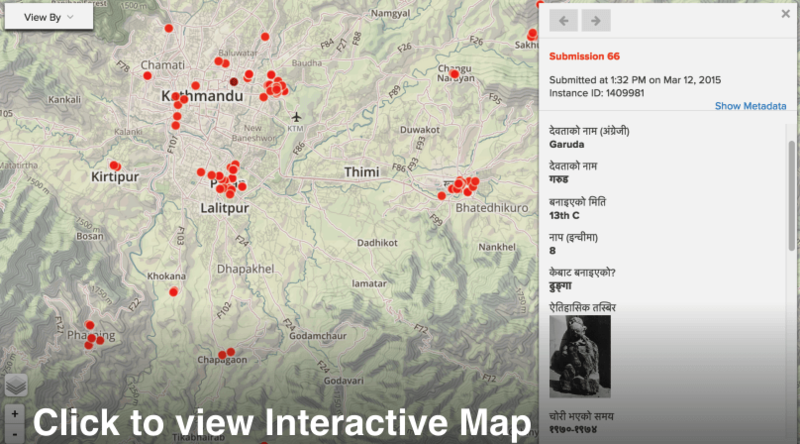 Click to view Interactive Map and Database of Thefts of cultural heritage from the Kathmandu Valley of Nepal. Please share this database with others who are interested in learning more about the theft of Nepal’s cultural property! On the map (first tab in the link), red dots represent sites of thefts. Zoom in and click on the red dots to learn of the thefts that occurred in those locations. The searchable and sortable database (second tab in the link, called “Table”) combines published and previously unpublished thefts and accompanying research by Lain S. Bangdel, Jürgen Schick, Sukra Sagar Shrestha, Mary Slusser, Govinda Tandan, Joy Lynn Davis, and others. 160 stolen sculptures are currently represented. Additional entries will be added in 2018. Through a collaboration with the UNESCO Office in Kathmandu, in 2016, the contents of this database were added to Interpol’s database of stolen art, aiding police all over the world in locating these stolen sculptures. Thousands of sacred sculptures have been illegally removed from public temples, shrines, fountains, and fields across the Kathmandu Valley since the 1960s. They have gone abroad to private collectors, dealers, storage facilities, and museums. A small number have been returned and a few others will be returning, but the overwhelming majority have not yet been located. Collecting photographic evidence, expanding and publishing the inventory of lost sculptures, and generating awareness are steps toward fighting illicit-trafficking and facilitating returns. Database designed and programmed by Prabhas Pokharel, 2015.